Business Continuity Management Framework is a comprehensive, word-processor-driven Business Continuity Management template with extensive Standards-Driven components reflecting the latest international standards. and it still requires a lot of work to complete the detail, without which any disaster recovery plan is worthless. Business Continuity Management Framework is different. 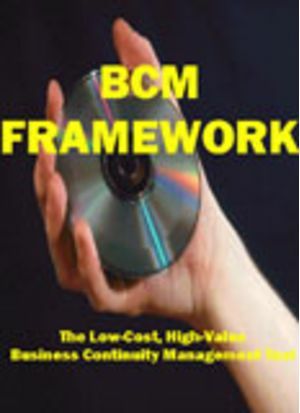 It features The ABC of Business Continuity Management A How To Guide, which is a step-by-step guide in MS Word format, with all the necessary forms, models and templates to conduct a successful Business Continuity project through the entire Business Continuity lifecycle, from Project Initiation, through Risk and Impact Assessment, Strategy Definition, Plan Development to Review and Testing. It conforms to the Project Lifecycle recommended by the Business Continuity Institute (BCI) and Disaster Recovery Institute International (DRII), compatible with British Standards Institution (BSI) BS 25999: the first national standard for Business Continuity Management, tipped to become an ISO standard. In addition, the CD includes many easily tailored modules from a combined total of over 150 years of consultancy experience--modules that are hand-picked as the most relevant to your own situation, culture, organization, equipment platform and infrastructure. It contains Model Business Recovery Action Plans for key corporate functions with Organization Schematics and role descriptions, with some vital -- and often forgotten -- actions included. The appropriate Outline Restoration Procedures may be selected from the best match with your platforms and environment. Business Continuity Management Framework offers a structured approach to achieve a disaster recovery plan for you in the simplest, easiest way. The plan can be developed in a style and to documentation standards compatible with your organization's culture and standards.